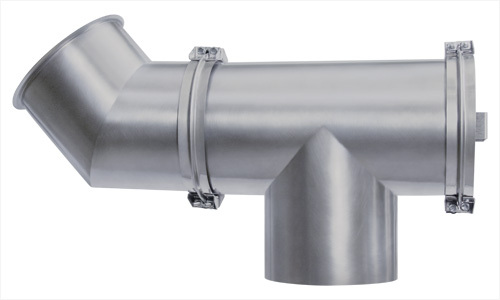 Grease Duct is ETL Listed, single wall construction made from 430 stainless steel. Duct diameters range from 8” to 24”, with multiple lengths and accessories available. Grease duct is ideal for use in kitchen ventilation applications where clearance to combustibles and temperature retention in the duct is not a factor. Duct system(s) are available as a stand-alone system, or as part of a fully integrated package, and are pre-engineered for optimum performance for exhaust fans and hoods. Grease ductis ETL listed to standard UL-1978,and does not have to be welded in the field. System can be used as a stand-alone duct system that can be integrated into a kitchen application. System can be used as part of a fully integrated packaged designed and pre-engineered for optimum performance with kitchen ventilation equipment. Duct systems that are part of an integrated system reduce the amount of rework and service calls. Non-welded duct saves on installation costs. Duct accessories and duct lengths have been designed so there is no cutting of duct in the field. Single source for equipment and duct. Reduced coordination and shipping costs due to single source supplier. Duct is manufactured on state of the art equipment. Duct and duct / accessories go through a robust quality control check making sure you get the very best product every time. Duct has been rigorously tested to comply with ETL. Grease duct is ETL listed to standard number UL-1978, duct does not have to be welded in the field.